In what sense can we speak about an architecture of the Great Plains? Such a narrative would necessarily derive from essential characteristics of the whole place–flora and fauna, climate and weather, geology, topography, and horizon–and would address building with compelling reference to this ground. Alternatively, we might speak of architecture on the Plains, using spatial location as our primary criterion. Either approach might work, but this essay will follow the former, first because the region is defined, in good part, by properties of the natural place, and second because architecture, at root, creates cultural places within natural place. Acknowledging natural place as the ground for architecture changes the perspective on our view of building. Congruence between these "two" places can be discerned by thinking of both in terms of form and structure or, metaphorically, as mind and body. Though it is not possible to conclude an entirely homogeneous interpretation of building from the diverse constructions on the Plains, this approach forces us at least to think about architecture and place in other than humancentered terms. This perspective reveals an incongruence between the two aspects of place that was present from the very beginning of European American entry to the Plains. This story is at variance with those we have heard before. Original peoples evolved within an architecture of place. Because the Plains region includes many places and peoples, a diverse realization of architecture occurred. This resulted in part from materials variability, in part from prevailing climatic conditions, and in part from evolving cultural preferences. A defining characteristic of all prehistoric architecture in the region was the use of construction materials taken directly from the place. Grasses played important roles, particularly in the tallgrass areas, where they were utilized for thatching, matting, and underlay and as wattling for clay-daubed walls. The most spectacular use was the historic Wichita lodge of the Southern Plains, though pole-and- grass huts may also have found early use in widely scattered Central Plains locations. Similarly, grassland soils played a role in most of the more substantial constructions. Partially excavated interiors were characteristic of many permanent lodges. Some early square and rectangular houses utilized wall systems of closely spaced posts that were wattled and daubed with clay. Clays were also used in the southwestern Plains to plaster floors, make wall bricks, and raise puddled walls. Highly consolidated soils or sedimentary rocks were utilized principally along the High Plains of the western part of the region. Caves formed by the erosional undercutting of streams were home to early big-game hunters along the northwestern Plains from 5,000 to 10,000 years ago. Later cave sites have been located all across the western margins of the region. Stone masonry dwellings were built in the rugged canyon lands and escarpments of the southwestern Plains. The use of soils culminated in the earth lodge. Plains fauna also provided raw materials for construction. Bison skins were used from historic times back into the more distant past, perhaps as many as 5,000 years ago on the plains of southern Alberta. 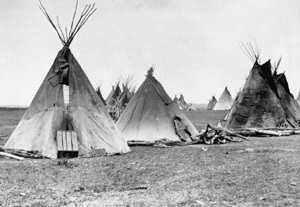 The historic tipi is the evolved descendant of a long line of skin lodges. The extensive repertoire of walling material contrasted with a limitation in roof structure. A scarcity of forested areas limited the location, size, and duration of permanent settlements. Temporary campsites and smaller lodges built of poles with mat, grass, bark, or skin coverings could utilize woods such as willow in more widely scattered locations. But substantial lodges needed large trees for posts, beams, and rafters; permanent villages were therefore built near major wooded streams and rivers. The formal aspects of this early architecture are more difficult to determine than its structure. Evidence gleaned from archaeological investigation is difficult to interpret, especially in projecting three-dimensional forms from two-dimensional remains. Nevertheless, two distinct patterns, one of circular forms and the other of rectilinear forms, can be broadly discerned. The oldest remains are found along the western High Plains, where ubiquitous rock circles mark the base of what were circular lodges. Rocks were used to secure the covering of the lodge to the ground or perhaps to stabilize the poles of the structure. Ancestral in design to the historic era tipi, these structures are oldest and most numerous on the Alberta Plains and become more widely scattered and presumably later to the south. The more recent circles mark larger lodges than earlier ones–the adoption of the horse by nomadic peoples increased the size of lodge that could be transported. The oldest remains are found along the western High Plains, where ubiquitous rock circles mark the base of what were circular lodges. Rocks were used to secure the covering of the lodge to the ground or perhaps to stabilize the poles of the structure. Ancestral in design to the historic era tipi, these structures are oldest and most numerous on the Alberta Plains and become more widely scattered and presumably later to the south. The more recent circles mark larger lodges than earlier ones—the adoption of the horse by nomadic peoples increased the size of lodge that could be transported. Among the oldest of the rectangular-pattern houses were those constructed at the beginning of the second millennium of the current era along the middle Missouri River of contemporary North and South Dakota. These semisubterranean houses had floors one or more meters below the surface, with entrance through the southerly end of the house via a long, covered ramp. A slightly raised platform usually occupied the entrance end and sometimes extended along the sides. The hearth was along the long axis. Structurally, these houses appear to have been gable-roofed buildings, supported by ridgepoles and side walls built of closely spaced posts. Entirely different rectangular houses have been unearthed in the southwestern Plains. Dating from nearly the same time, one built in the upper Washita River drainage contained a central hearth and two central posts. This plan is similar to lower Arkansas valley Caddoan houses of the mid.thirteenth through mid.fourteenth centuries. Closely spaced posts around the perimeter indicate wall lines and narrow, protruding entrance passages. The roof was likely hipped and thatched, while walls appear to have been closed with wattling. More ubiquitous was a square, four-post lodge that appeared throughout the Central and Southern Plains from the tenth through the fifteenth centuries and that came to be adopted along the middle Missouri River somewhat later. Built with considerable variation in size and detail, this house type appears to be an enlarged version of the two-post rectangular house, constructed with a hipped or pyramidal roof. The nearly square plan typically had rounded corners with walls of closely spaced posts that undoubtedly were wattled and daubed. On the western portions of the Central Plains they were built on or near the surface, while to the east they were semisubterranean. Initially, square houses were not oriented to any particular direction, but over time the four posts came to be set at the semicardinal points. As the structure was reoriented, the entrance vestibule was typically built facing east. The commodious interiors utilized a variety of features, such as benches and screens, to divide the space into different compartments. Square-lodge villages were typically located on the first or second terraces of rivers and streams, while the village pattern, regardless of size, tended to organically follow the terrain of the terrace. Fortifications were rare except in the middle Missouri region of the Northern Plains, and there they protected only a portion of the extended village. Perhaps the most distinctive adaptation of the four-post square house occurred along the southwest margins of the Plains in the upper Canadian drainage of what is now the Panhandle of Texas. Particularly interesting are villages in the Antelope Creek basin, where the house was oriented to the cardinal directions and had a very low, east-facing entrance passage. The house floor incorporated raised benches with storage bins. Another raised platform, either protruding into the house or occupying a projecting extension of the west wall, was often found opposite the door. Hearths were centrally located. Construction technology further distinguishes these houses. Walls were built of puddled clay or clay bricks alternating with horizontal stone slabs. Occasionally, vertical posts were used to stabilize the clay walls. Most interesting was the use of various forms of rock foundations and footings: single or double rows of vertical stone slabs set into the ground, the latter with rubble fill, comprised the most unusual system. Village patterns were also distinct. In several, lodges were built contiguously into large communal blocks that seem to have been a function of choice and not of site limitation. Room configuration was complex. Circular rooms served as antechambers to one square house in each block, possibly indicating some kind of communal function. Other multichamber complexes were built farther to the northwest along the upper reaches of the Canadian and Arkansas drainages and to the east along Ladder Creek, a tributary of the Smoky Hill River (in contemporary New Mexico, Colorado, and Kansas, respectively). The latter, a pueblo-like construction, dates to after the Pueblo Revolt of 1620. Known as El Cuartelejo, it was associated with the Plains Apache. Even as the house-pattern preference of the Plains villages coalesced around the four-post square lodge, a shift toward a circular plan had already begun. Four-post circular lodges, presumably walled with wattle and daub like their square counterparts, were occasionally found as minority forms within some square-house villages. Examples from about A.D. 1000 to 1400 appeared along the Salt Creek drainage of the Smoky Hill River in what is now western Kansas and along Muddy Creek in the South Loup River system of present-day Nebraska. Other early circular lodges existed to the south of the High Plains rock-circle clusters in the rugged Apishapa Canyon of the upper Arkansas River in present-day southeastern Colorado. Dating from the latter half of the thirteenth century, these were singleand multichamber dwellings constructed of upright stone slabs. They varied in size from postless and single-post to four-post structures; the latter seems to anticipate four-post circular earth lodges. The circular earth lodge itself apparently appeared after 1450 and was common until the European American invasion. This house type was adopted by virtually all the semisedentary communities from the Central Plains northward. It was like earlier square lodges in the utilization of the four interior posts, the central hearth, the extending entrance vestibule, and the system of roof rafters. Aside from its plan, major distinctions from its predecessors occur in the perimeter structural system and the earthen covering. In structure, vertical wall members were replaced with a post-and-beam system, and roof rafters rested on the beam rather than on a wall plate. Wall members were leaners that rested against the perimeter beam. The space beneath these leaners, to the outside of the posts, was used for a variety of purposes, including sleeping platforms, storage, and altars. Other lodge types of the protohistoric period adopted the circular form as well. Hunting camp lodges along the middle Missouri of Pawnee earth lodge, ca. 1871 the Northern Plains were built with four center posts whose beams supported leaners that peaked like a tipi and marked a circle on the ground. Central Plains Apaches built seasonal lodges that made the circular motif more explicit. There the imprint of the leaners was mirrored in the internal structure, where typically five and sometimes six interior posts were set in a circle around the hearth. The entrance was less an appendage than a protuberance of the curvilinear form. On the Southern Plains another circular lodge emerged that became a Plains house type of importance equal to the earth lodge. Known primarily from historic Wichita structures, the thatched or grass lodge utilized wall-roof poles set firmly into the ground, bent across an internal post-and-beam system, and tied together at the peak. Light horizontal stringers were tied to these "rafters" to strengthen the frame and provide support for bundled grass thatch. Another set of stringers was applied over the thatch to help secure it to the frame. Older grass lodges in the Red River valley along the Texas-Oklahoma border apparently were built upon a four-post plan. The evolved Wichita house, however, utilized a circular, multipost system that retained some of the significance of the old four-post lodge in the designation of principal posts for the four directions. A similar evolution occurred with the earth lodge into the historic period, at least among some tribes. Protohistoric Pawnee villages in the lower Loup River valley of present-day Nebraska were composed of four-post circular lodges, while historic Pawnee lodges utilized from six to eight or twelve interior posts set in a circle. This was also the case with historic Omaha lodges. Thus, while four-post circular lodges continued to be built on the Northern Plains, in the Central and Southern Plains four-post structures gave way to multipost circular structural systems that reflected the circle described by the external walls. While the full meaning of this evolution cannot be known, some significant patterns can be discerned. Three principal architectural forms share the multipost–or multipole– circular configuration. All three utilized exterior surfaces that were, in essence, angular projections that began the vaulting over of the dwelling from the plane of the earth. Neither wall nor roof in the Western sense, these surfaces formed a continuous vaulting of the dwelling that projected upward from a circle inscribed on the earth. 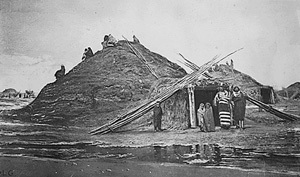 The whole material body of the Plains was also reflected in these forms: soil, the geological and biological basis for the life of the place, was reflected in the earth lodge; grass, the principal flora of the Great Plains, was reflected in the thatched lodge; and bison, the principal faunal life of this place, was reflected in the skin lodge. In a real sense, the mind of original Plains peoples converged with the body of the place and evolved a climactic Great Plains architecture. The shapes and cycles of things were echoed in the evolved architecture. The vast expanses of the Plains are defined by the circular horizon, and from the horizon vaults the still more vast sky. Within this expanse the rhythmic cycles of the cosmos–of the earth, moon, sun, and stars–are plainly evident. Here the great circle of the terrestrial world, the horizon, marked the boundary of place. Native peoples reflected the shape of the place in forms that mirrored the place. Cycles and the place were celebrated in material form–from lodges to medicine wheels and from great camp circles to contemporary dance arbors. Further evolution of Native architecture was eclipsed by the rapid conquest of the Plains by European Americans, who defined the place from a distance. Disembodied, abstract concepts– following the Cartesian lead–took power and control over the ancient evolved body of the place, and anthropocentric priorities began to rift the place to pieces, first in mind, then in body. The Great Plains was objectified on desks in Washington and Ottawa, fueled by concepts of property and reports from scientific and military expeditions. New territories were defined by imaginary lines such as those drawn in abstract space using the global grid. This grid became part of the "architectural" transformation of the Plains; its extension via government surveys imposed a uniform Cartesian net over the whole of the "flat" and "empty" land. Ultimately, the cultural expression of these lines effected the complete transformation of place, with property lines determining the limits of thought. Three institutions–the fur trade, the military, and the railroad–cleared the way for European American resettlement and the final phases of disembodiment. Though the early architectural presence of these institutions gave an appearance of being in place due to their use of local materials, their architectures quickly evolved into modern facilities of extraction in keeping with their institutional intent. Their mature architectural forms rereflected the power their enterprises had over the body of the place. Fur traders, here to strip the Plains of its fur- and skin-bearing animals, were the first to make permanent constructions. Early Missouri River posts were typically built of horizontal logs cut from the forested valley. Fontenelle's post at Bellevue (1822), in present-day Nebraska, consisted of individual buildings set around a loose, partially fenced courtyard. Its otherwise benign appearance was belied by the size of its warehouses. Later constructions such as those at Fort Union at the mouth of the Yellowstone (established in 1828) were formally designed, fully stockaded compounds. The head trader's house there is an early example of the elite colonial designs that quickly made their way onto the Plains. Other fortified compounds were built, beginning in the 1830s, as new centers of extraction were established on the western High Plains. Wood was not abundant there, so clay technologies adopted from Hispanic sources were utilized. From Bent's Fort on the Arkansas northward to Fort John on the North Platte, the spread of southwestern construction techniques was made possible by an abundance of clays and a liberal use of Latino labor. Built as variations on the Spanish presidio, the adobe forts embodied corporate power with controlled, hierarchical plans that only looked premodern because of their old structural systems. The second wave of corporate technology was associated with U.S. military campaigns. Pursuit of the nomadic western tribes for the security needs of traveling European Americans led to the initial establishment of numerous temporary posts. Selective adoption of premodern techniques facilitated construction where the preferred materials were rare or nonexistent: adobe masonry and panel-wall log construction are just two examples. Seldom were these valued for permanent installations. Lumber was imported as soon as possible, and by the turn of the twentieth century brick veneers were used extensively to lend an aura of permanence and substance to the most important posts. Unlike the compounds of the fur traders, military architecture on the Plains was rarely fortified; industrial weapons technologies obviated this need. Drawn from Anglo-American architectural traditions, forts were orderly collections of individual buildings, hierarchically arranged and properly attired. Commanding officers' quarters were patterned after the hierarchical central-passage houses of eastern merchants. Though often scaled back to one and a half stories in height, their symmetrical facades and front galleries symbolically reinforced the government's role of establishing control over the region. and character of the resettlement. Extensions into "unsettled" country allowed them to establish stops, to plat and own towns, and to control the towns' development. Rail towns were laid out following a small repertoire of plans, all focusing on the depot as the central place. Control of these geometric plats allowed railroads to shape the character of towns by deciding which lots were sold for what purposes and in what order. Business districts were created in immediate proximity to the depot, while churches and residential lots were pushed to the periphery. The depot was the most intentionally symbolic structure. Plains railroads adopted standard plans that allowed for a variety of selections depending upon the position of the community within the economic structure of the corporation. Noteworthy among Plains designs was the residential depot, which provided housing for agents in locales that were not yet developed. The most common of these had living space on the second floor above passenger waiting rooms and agent offices. Standard plans gave way to custom designs in communities that established themselves as significant economic entities. Elite designs created symbolic images for both the community and the corporation. This became problematic after World War II, when passenger service declined or ceased altogether. Corporations often quickly removed passenger stations, so that today the sight of a depot is rare and rarer still in its original location. Given the depots' prominent siting, their removal has often left significant gaps in the urban landscape. An even greater impact of rail technology was in the movement of people and goods. This contribution to the disembodiment of original place facilitated the commodification of agriculture, with its widespread replacement of native flora and fauna. In addition to stockyards and trackside corrals, the most permanent and symbolic of the structures of disembodiment was the grain elevator. The early stacked-lumber elevators have largely disappeared except, perhaps, in more remote regions of the Northern Plains and Prairie Provinces. Victims of truck transport and corporate consolidation, the wooden structures were replaced with larger facilities built of reinforced concrete. The most substantial of these are in gateway cities along the fringes of the region. As the largest and most monumental constructions in the region, they symbolize the region's modern role as grain supplier to the world. Another architectural result of this activity was the emergence of sod-wall construction. Utilized over vast areas of the central and northern farming Plains, it flourished with increasing European American settlement in the 1870s and followed wherever the prairies were broken. Its success as a building technology relied upon the manufacture of the steel plows needed to cut the tough prairie-grass roots; its demise rested upon Anglocentric notions of "proper" dwelling construction, the proliferation of industrial building technologies, and the destruction of the native prairies. The rest of the architectural story is dominated by the importation of building materials and abstract architectural ideas. The materials needed to accommodate Anglo-American ways of building did not exist in quantity in the Plains, so the new architectural body turned its back on the region. The story is one of replacement. The existing place didn't feel like a potential home to European Americans, who had mostly been a people of the forest, first in Europe and then in America. On the Plains everything was strange and seemingly empty; as one early traveler put it, a single tree would have been enough to relieve the pain of loneliness and desolation. That tree would also have provided the preferred building material of the newcomer, and so wood, in the form of imported lumber, became critical to the replacement. Though some wood was processed locally in river towns, regional riparian stands of timber, following the decimation wreaked by overland travelers, the army, the railroads, and the telegraph, were insu.cient to meet anything but rudimentary local needs. Exogenous lumber was first supplied by steamboat, and some precut houses were imported during the first years of settlement. But it was the completion of the transcontinental railroads that started the massive importation of lumber into the Plains. The resettlement was built from the body of the upper midwestern and southern forests, and the trackside lumberyard became another symbol of European American resettlement. Prior to the o.cial opening of the Plains, the evolution of American wooden building had begun to standardize around light frame construction with nail joinery. Locally, however, framing initially followed diverse patterns. Heavy braced frames continued to be built for a time by easterners and some Germans, but increasingly these were superseded by modern light wooden frames. Idiosyncratic hybrid framing was not uncommon, but eventually the technology settled on more or less standard balloon and western platform frames. The thought behind the replacement was as out of place as the lumber, and this was reflected in the forms the replacement took as well. In the more heavily settled sections of the region the superimposed spatial grid influenced the character of the new landscape from the beginning. Roads, fields, fences, lanes, farms, schools, churches, and towns all became subsets of the grid. Terrain and waterways no longer ordered culture or formed place; section roads and property lines did. In the farming countryside checkerboard fields planted in straight monocultural rows drilled the modern mechanistic order into the land itself. The place became changed at ever deeper levels. Architectural form followed from the same mind that overlaid the landscape with the abstract grid. Though this modern, abstract mind held sway over the Plains, some communities initially embraced a wider variety of attitudes. Architecturally, before the final triumph of national modernism a more diverse presence established heterogeneous places throughout the region. For a time the Great Plains was inhabited by an international community–a historically contingent, multicultural presence of quite different and sometimes opposing belief systems. Their initial constructions represented a wide array of responses to the challenge of making place. Foreign immigrants often built in old ways that were familiar and comfortable. The transference of old forms was restricted by the extent a material was available to build in the traditional way. If it was not, or if one were instead attempting to conform to emerging national standards, then the old form was either abandoned for a new one built of lumber or it was modified to accommodate the new material. When we think in regional architectural terms, we naturally look to the materials that form the body of the place, and here, due to notoriety, the sod wall comes first to mind. Its utilization across a broad expanse of the farming Plains, irrespective of culture, made the sod-wall dwelling a true regional vernacular of the replacement. The nature of the material's association with disembodiment, however, precluded its utility beyond the first or second generation of houses. Constructions of baled biomass (hay and straw), perhaps the only regional architectural invention, might have provided a sustainable counterpart to sod, though it appeared too late and in areas too sparsely settled to have had an immediate impact. Its recent resurgence is another matter. Less popular than sod but still widespread were various clay-wall technologies. Unfired clay found use in brick masonry, puddledclay, and rammed-earth constructions; its many iterations were known by diverse terms, depending upon the culture that utilized the technique. The clay technologies were primarily culture-bound, and while they were preadapted to the Plains environment, their adoption by others appears to have been only idiosyncratic. Black Sea Germans, Czechs, Poles, Ukrainians, and Hispanics were among the dominant builders in clay. Diversity was also a theme in the utilization of other native materials. Variation in the type, quantity, and quality of stone led vernacular and elite masons to a remarkable variety of construction in surprisingly widespread locales, virtually everywhere su.cient veins of good-quality rock were found near the surface. Where quantity and quality supported commercial quarrying, elite buildings were constructed. High-quality architectural work can be found everywhere stone was used, but probably nowhere in such concentrations as in the Sioux Quartzite areas of southeastern South Dakota or the Flint Hills of eastern Kansas, where sophisticated dressed ashlar work was common. Perhaps most surprising for the "treeless" Plains was the extent of log construction during the early settlement period. Diversity arose from the multicultural background of builders and the mixed flora of the region. Most of the log-timbering methods known to have been brought to America, as well as those that evolved on the continent, were utilized on the Plains. Two factors influenced the use of native material: the first in which the "pioneer" was forced as a matter of necessity and a second in which settlers chose native material as a matter of preference. The former was spatiotemporally restricted to the ever-shifting line of resettlement. Few surviving constructions were built from strict necessity, and most of what remains derived from cultural preference. These were built predominantly by Germans, German Russians, Poles, Czechs, Finns, Hispanics, and Ukrainians. Cultural diversity was also reflected in architectural form, especially among rural folk and the more conservative immigrants and during the first, second, and sometimes third generations of dwelling construction. Usually the diversity was the result of the direct transplantation of Old World forms. Though dwelling types were all within a familiar western mold, the constructions of foreign-born settlers were often noticeably distinct from those of the native-born. Many early dwellings were built along ancient plans that accommodated preferred ways of living. Most of these modest dwellings were characterized by the presence of principal rooms– called halls in the English American tradition– and open plans that allowed direct entry into these rooms, preserving old, intimate relationships between the house and the land. The most prominent of the traditional builders were the Germans, German Russians (both Black Sea and Volga), Czechs, Poles, Ukrainians, and Danes. Their old plans were modified, with rare exception, by the adoption of American cast-iron stoves for heating and cooking. The abandonment of old-style hearths, stoves, and ovens did change the interior character of dwellings and often necessitated modifications to traditional foodways. Some built larger, more modern Old World dwellings, while others such as the Volga Germans and Danes chose from American house types that closely resembled familiar European forms. Though some Anglo-Americans initially built traditional houses (usually a hall-andchamber house), most erected modernized plans that abandoned halls in favor of kitchens and parlors. Other principal features of this modernization, whatever the kind of house, included the use of multiple thresholds and the accommodation of bedrooms and dining rooms–all reflective of the increasing dwelling size and room specialization characteristic of modern society's movement toward privacy, individuality, and separation from the land. Most of the early modern houses were variations on popular Georgian planning and formal symmetry. Later settlers adopted house types derived from rapidly changing national architectural fashion. The specific sequences of both the foreign- and native-born developments varied depending upon where and when initial settlement took place. In the main, however, the architectural story of the Great Plains after European American immigration was about an architecture that just happened to be built on the Plains. In the broad sweep it was not substantially different from that developed anywhere else in the United States. There is no reason to retell that story here using local examples. It is, however, important to at least acknowledge the surge of national modernity as it played out on the Plains. Easterners wasted little time in setting forth the national parameters within which this new place was to be defined; lumber was first, and the architectural pattern book was second. Mass-produced pattern books made the transference of formal architectural ideas out of place possible. Designs no longer needed to respond to locale; rather, they became abstractions that could be built on any "site," anywhere. Pattern books by eastern and British architects had already been a means for expressing and disseminating elite architectural ideas before initial resettlement began. Stylish houses could be and were built soon after the various territories were opened. By the turn of the twentieth century, books by architects such as Chicagoan William Radford were produced for more popular consumption. Mail-order catalogs were likewise published by retailers like Sears and Montgomery Ward, offering not only designs but also precut materials ready for shipment. Soon local builders and lumberyards produced catalogs depicting their own repertoire of house designs. These were increasingly built in tracts of similar or identical dwellings. National and "progressive" trends in farm building design were also perpetuated through the state and national agricultural journals that proliferated from the late nineteenth century. Following trends established earlier in architectural publications, they offered advice on lifestyle as well as technical information on buildings. Land-grant universities published technical leaflets with designs for essential farm and ranch building needs. The impact of these was substantial, and from around 1900 onward the agricultural landscape became architecturally more homogenized. As the demand for architectural and engineering services increased, especially in the cities, more architects from the East migrated west. Some were trained under the apprenticeship system, while others, both native- and foreign-born, had also received academic training. Custom buildings of increasing structural competence and design sophistication were soon raised on the Plains, beginning in the boom years of the 1880s. By the next century academic training was virtually the norm. Education was provided by leading schools in the East, technical universities in Europe, and the Ecole des Beaux-arts in Paris. Some Beaux-arts-trained architects such as Thomas Kimball of Omaha were native sons who returned home after completing their schooling to contribute to the development of the region. Local apprenticeship systems produced an extensive lineage of architectural practice that became the foundation for the licensed practitioners of the twentieth century. By midcentury several state land-grant and provincial universities had established architecture schools. Some local architectural firms have become national and even international concerns, made possible by the ideological trends of modernity and a globalizing economy. Great Plains architectural output from the beginning of the replacement replicated abstract, national, and modern trends. Essential influences emanated from eastern cities, then from Chicago, then from the Pacific Coast, and finally from avant-garde Europe. Plains architects creatively adapted national and international design ideology to local problems, especially in the cities and for elite clients. Most moved freely from style to style (a legacy, first promoted by pattern books, of reductionism applied to architecture that divorced the design of a facade from the function and structure of the building) and have done so in every era to the present. Architects were often imported from cities like Chicago, Minneapolis, Kansas City, St. Louis, and New York for the most prestigious commissions. While society's attitudes toward the modern were national, there was no tendency toward a national style following European American entry to the region. The national classical revivals of the first half of the nineteenth century were on the wane when resettlement commenced, and what followed was a rapid succession of stylistic gyrations. The first to proliferate on the Plains was the Queen Anne; it was a style with national extent, but it lacked national meaning. On the Plains the ethno-English associations of the style were vague; its popularity was more related to a booming economy, ideas of modern "progress," and incipient suburbanization–all concepts that had national overtones of their own. Otherwise, architectural style changed like the prairie winds with the fickle tastes of consumer capitalism. Excellent products of these multifarious national and international trends dot the landscape, interspersed with delightful local and popular versions. But anything that might be suggestive of a distinct architectural character in the region was more the result of historical contingency. Boom periods–via the sheer quantity of construction–established an initial character to rural and urban landscapes that was distinct from older areas, east or west. These remain present in most locales that peaked economically before the current era. Communities that experienced continued growth typically replaced the replacements and now are tending to resemble the "anywhere" landscapes so emblematic of our time. In this kind of setting, individual monuments serve as symbols of place. Two forms of architectural differentiation appeared during the first part of the twentieth century. The first sought explicit ethnocultural meanings. Designs generated by some foreign immigrants as they emerged from the background of settlement and forged a greater cultural presence on the land created distinctive local environments. Their architectural differentiation was more pronounced in a host environment dominated by revivals intended in part–via adoption of very selective European and American sources–to create the solidification of cultural hegemony. The second was intended to be a resistance to modernity, an attempt to reground architecture in nature and place through a revival of vernacular design, craft tradition, and, if not indigenous materials, at least the use of natural materials. Ethnic architectural emergence by some groups appears less culture bound than the result of individual or community tastes and idiosyncrasies; these groups tended to assimilate quickly, with a concomitant architectural melding into the host landscape. Among them, however, Swedes did participate in an Academic form (a self-consciously learned and sophisticated approach to the revisioning of earlier styles) of what has been dubbed "National Romanticism" via the Augustana Synod architect Olof Z. Cervin of Rock Island, Illinois. His picturesque churches drew inspiration from national revivals then current in the Nordic countries. The most explicit of his work was the yellow brick, stepped-gable campus of the Bethphage Mission in Kearney County, Nebraska. Danes also drew inspiration from the revivals in their homeland, though in a more provincial mode. This was evident in picturesque designs for folk schools such as at Nysted in Nebraska, but a more ubiquitous if less obvious ethnic presence was provided especially by Grundtvigian Danish churches, gymnasia, and other community buildings whose interiors were richly walled and ceiled in wood. This harking back to a distant forested past–and recalling wooden seafaring vessels–represents a distinct architectural expression on the Plains. Also provincial but more a part of an Old World cultural continuum than a revival was the adoption of simplified baroque designs for the community buildings of freethinking Czechs. This "rustic" baroque was part of a nearly three-century extension of the European style. The latest Plains example was the 1921 Kollár Hall near Dubois, Nebraska. The later Orthodox churches of Ukrainian settlers in the Prairie Provinces were also continuations of traditions that had been perpetuated earlier in pioneer church buildings. The free expressions of Alberta architect Father Philip Ruh stand out, such as his Ukrainian Catholic Church of the Immaculate Conception of 1930 at Cooks Creek, Manitoba. In it Ruh retained the multipart articulated massing of traditional churches topped with domes (though not onion domes) but departed from tradition in his Germanic decorative embellishment. More Academic in origin and related to the immigration of trained architects was the appearance of two German American national styles. Designs based upon the German Gothic were unobtrusive in the American context. Major examples of this Spitzbogenstil, or pointed-arch style, were built in German settlements throughout the region: Sioux Falls architect Joseph Schwarz's Holy Family Catholic Church (1903–6) in Mitchell, South Dakota, and J. P. Guth's St. Johns German Evangelical Lutheran Church of 1902 near Lyons, Nebraska, are representative of two common variations. The second, the Rundbogenstil, or round-arch style, was more than an ecclesiastical style. Breweries and other commercial and public buildings in German-dominated places were often constructed in this popular style. Frederick W. Paroth's St. Elizabeth Catholic Church at Auraria, Colorado (1898), Anton Dohman's St. Mary's Abbey Church at Richardton, North Dakota (1905–9), and Omaha's Anheuser Busch Beer Depot (1887) are exemplary of a very large repertoire of such designs. The impetus toward national styles throughout Europe in the nineteenth century grew from emerging nation-state identity, an issue many immigrants brought with them. But the impulse applied equally to the dominant culture in the United States. By the turn of the twentieth century, a Georgian Colonial Revival coalesced that had national overtones among the native-born. Domestically, the style, reinforced in part by xenophobia, segued into various English Period house styles around World War I, then expanded to include period house choices from the western Europe of the old immigration. Multiplicity was the rule for the nondomestic architecture of the first half of the twentieth century as well, but it was really a focus on taste and massive scale associated with the Academic trend in architecture that characterized American national romanticism of this period. Styles were chosen based upon oftenvague notions of association–sometimes institutional, sometimes personal. Thus it could happen that an Academic skyscraper adorned in the Gothic Revival–a sort of "cathedral of commerce"–could appear a few blocks from a new Gothic Revival church, with no apparent contradiction in meaning. Whatever the associations, they may never have been known to the community at large. Such was probably the case with the appearance of the Romanesque Revival for many Catholic churches of this period. Derived from the Italian mode, the style flowed from Vatican influences within the religious hierarchy. To outsiders, taste and substance were probably the primary indicative aspects of Academic national romanticism. Though lacking in substance, this taste was promoted through a series of national expositions, including the Trans-Mississippi and International Exposition of 1898 in Omaha. Another impulse of the trend toward associational design was a return to American regional culture. The lack of a prior European American presence on the Plains, however, was problematic. There was no regional style here to revive. One solution to this deficit was the use of imagination. Coronado's trek into the Southern Plains provided su.cient impetus for Omahans Thomas Rogers Kimball and Archbishop Richard Scannell to conjure the Spanish Colonial Revival as a style appropriate to the Central Plains. Kimball's St. Cecilia's Cathedral in Omaha of 1905.59 initiated an identity with the American Southwest before Goodhue's national popularization of the style at the 1915 Panama-California Exposition in San Diego. Spanish influences were more prominent on the Southern Plains, where the baroque also found expression in a variety of eclectic designs such as the city hall and auditorium of 1927 in Wichita Falls, Texas, by Lang & Witchell in association with Voelcker & Dixon. The restrained mission style was more popular, again particularly on the Southern Plains, where it was adopted by the Southern Pacific and Santa Fe Railroads as part of their corporate identities. The Santa Fe station at Great Bend, Kansas, is perhaps exemplary. Kansas City architect Louis Curtiss's more inventive reprisals of southwestern forms such as his 1907 depot and hotel at Syracuse, Kansas, and the 1909–11 Lubbock, Texas, depot are probably high points of this kind of regional identity. As remote as these associations seem today, they do appear more grounded, at least in the South, than the more imaginary associations drawn directly from the Mediterranean such as the 1918 Broadmoor Hotel in Colorado Springs. The various forms of romanticism held sway side by side with the California Craftsman styles that were popularized in the Plains in the Bungalow movement of the 1910s and 1920s. Craftsman houses were unlike the period revivals in that they lacked cultural roots in the American scene. They were similar to them, however, in a favoring of craftsmanship and vernacular design as well as a philosophical intent to reground buildings in nature. The import of both movements from the East and West Coasts, however, merely continued the trend of building out of place. Neither style's attempts to build with indigenous materials were very successful. With rare exceptions, these buildings were little more than philosophical statements lacking connection to the Plains. During this period indigenous materials were used almost exclusively in recreational architecture such as the river rock constructions at the Medicine Park Resort in southwestern Oklahoma, the earthen shelters of Emiel Christensen's private retreat, PaWiTo, along the Platte River in Nebraska, and the occasional public works project. Exceptions, however rare, can always be noted. A shortlived river rock vernacular developed on the Plains near Medicine Park, Oklahoma, and here and there distinctive porches appeared on bungalows throughout the region; those built with glacial erratics are probably the most spectacular. One Chicago influence was related to the Craftsman style in a general way. It was felt in the Plains to an extent in Prairie-style adaptations that borrowed superficial motifs for application to otherwise derivative Colonial and catalog forms. The style probably had the closest theoretical a.nity to what might have been a Plains architecture but was fully realized by only a smattering of buildings. This, in spite of the fact that the Plains boasted examples of both Frank Lloyd Wright's earlier and later Prairie houses: the Sutton house of 1905 in McCook, Nebraska, and the Allen house of 1915 in Wichita, Kansas. Fundamental Prairiestyle forms–such as low, horizontal, hiproofed houses–reappeared after World War II with the popularization of suburban ranch-style houses. But these were principally unrelated to the earlier movement and had their genesis on the Pacific Coast. Beyond these halting movements, an impetus toward regional differentiation simply never materialized, other than through individual efforts. The ephemeral Corn Palace at Mitchell, South Dakota, and the Texas Spring Palace at Fort Worth are two unconventional examples. Both were built to celebrate a kind of cyclical architectural stylishness with their annually changing facades of modern products derived from the body of the Plains; at Mitchell, however, the motifs are applied to a building designed following Moorish sources. More permanent regional motifs appear in places with varying degrees of appropriateness and success. The cowboys and Indians at the Frontier Hotel in Cheyenne (1936) and the architectural inscriptions utilized on the Natrona County Courthouse in Casper, Wyoming, are examples. The cowboy and Indian had appeared earlier as incised sculpture on the frontispiece of the Panhandle-Plains Historical Society Museum of 1932 at Canyon, Texas. Architect E. F. Rittenberry also incorporated the sculpted head of a longhorn steer and a gridwork of local cattle brands surrounding the entrance. Perhaps no effort surpassed that of architect Bertram Goodhue for the Nebraska State Capitol. It was not regional in style but was an effort to generate monumental form that was responsive to the Plains landscape. Though much about its design and embellishment was anticipated by the local elite, it came to Goodhue alone to conceive of the broad horizontal base and landmark tower in terms that were modern and more explicitly symbolic of place. Goodhue's genius needed an equal in local visionary Hartley Burr Alexander to develop the thematic elaboration of the building. His plan for the murals, mosaics, exterior sculpture, and inscriptions was broadly historical, occasionally transcendental, and firmly rooted in the ethnocentric milieu. Themes associated with place were prominent. Both the Canyon and Lincoln buildings were reflective of an emerging modern style. In spite of its initial theoretical concern with "space," even European modernism in the Plains ultimately continued to promote a progressive and reductive architectural style. This cause has been taken up with even more seriousness by so-called postmodern (really hypermodern) developments, in which now, quite literally, decorated facades and the seeking of new forms have again become principal architectural problems. Other aspects of modernism's focused reductionism have different consequences. We can look to a further loss of the sense of body in place that might have been anticipated by one of the region's most noted modernists, Norman, Oklahoma's Bruce Goff. The philosophical and psychological split of mind from body that has informed this essay and that rift site from place could be exaggerated by Goff's free expressions, which seem to have been made possible only by the prior abstract detachment of site from place. He further pursued architecture as a container split apart from the outside, a container in which the appearance of nature, if it were allowed at all, would be thoroughly domesticated and constrained from the inside. This latter aspect of Goff's production raises issues concerning a hypermodern extension of the replacement. Of what we can say is left of spontaneous Great Plains place (topography and atmosphere), neither seems destined to survive our assault. Suburbanization's sprawling consumption of land increasingly results in the massive replacement of terrain and topsoil. Topography is forced into the flat linear conditions of abstract space and the engineer's drawing board and then is sometimes mechanically reintroduced to add "character" to the new, designed landscape. Concerning atmosphere, the replacement further affects human embodiment in place. The main vehicle for this effort is air conditioning, a technology that, no matter how desirable under acute health-related conditions, conflicts with atmospheric place beyond the effects of consumption and pollution. Hypermodern promotion of air conditioning, designed within a very narrow and absolute "comfort zone," serves to further human disembodiment through a more anesthetized disengagement from place than ever before. See also IMAGES AND ICONS: Corn Palace / INDUSTRY: Fur Trade, Lumberyards / NATIVE AMERICANS: Paleo-Indians, Pawnees, Sacred Geography, Wichitas / WAR: Frontier Forts. Boddy, Trevor, ed. "Special Issue on Prairie Architecture." Prairie Forum 5, no. 2 (1980). Erpestad, David, and David Wood. Building South Dakota: A Historical Survey of the State's Architecture to 1945. Pierre: South Dakota State Historical Society Press, 1997. Henderson, Arn, Frank Parman, and Dortha Henderson. Architecture in Oklahoma: Landmark and Vernacular. Norman OK: Point Rivers Press, 1978. Henry, Jay C. Architecture in Texas, 1895–1945. Austin: University of Texas Press, 1993. 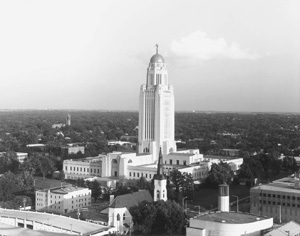 "Historic Places: The National Register for Nebraska." Nebraska History 70, no. 1 (1989). Nabokov, Peter, and Robert Easton. Native American Architecture. New York: Oxford University Press, 1989: 122–73. Noel, Thomas J. The Buildings of Colorado. New York: Oxford University Press, 1997. Sachs, David H., and George Ehrlich. Guide to Kansas Architecture. Lawrence: University Press of Kansas, 1996. Starr, Eileen F. Architecture in the Cowboy State, 1849–1940: A Guide. Glendo WY: High Plains Press, 1992. Upton, Dell, ed. America's Architectural Roots: Ethnic Groups That Built America. Building Watchers Series. Washington DC: Preservation Press, 1986: 100–165.